Butte College backup quarterback Taylor King threw a 65-yard touchdown pass to wide receiver Miles Fishback as time expired lifting Butte to a 27-24 win over American River College Saturday in a game with playoff implications. Butte took possession with 14.9 seconds left and ran two plays, the first of which was an incomplete pass. With 9.7 seconds on the clock, Butte brought King for the last play of the game, presumably for King’s arm strength. King’s prayer toward the end zone was answered when Fishback came down with it, stunning ARC players and sending Butte fans into a frenzy. The loss was big for ARC, which no longer controls its own destiny for postseason play. “With a win here we would have been in (playoffs), now we’re going to need some help,” said head coach Jon Osterhout. The final play was not without controversy, as a flag was thrown indicating that at least one official thought that Butte quarterback Taylor King had crossed the line of scrimmage before his game-winning heave. Officials convened briefly before the flag was picked up and Butte escaped with a win. 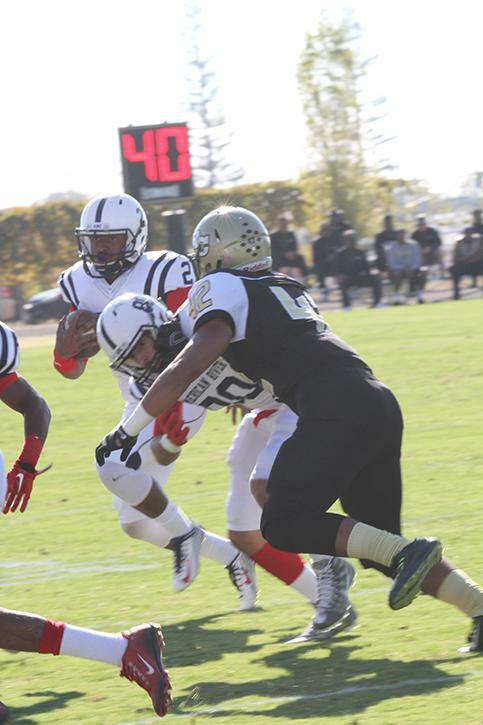 ARC quarterback Jihad Vercher thought the defense got fooled on the play. Wide receiver Jonathan Lopez agreed with Vercher’s assessment. ARC led the game in every statistical offensive category, out gaining Butte 447 to 419 in total yards, 307 to 289 pass yards and 130 to 140 rush yards. ARC, however, racked up a total of 135 penalty yards which stalled several drives. “Penalties go both ways, but at the end of the day in that situation we have to execute to win a football game,” said Osterhout. 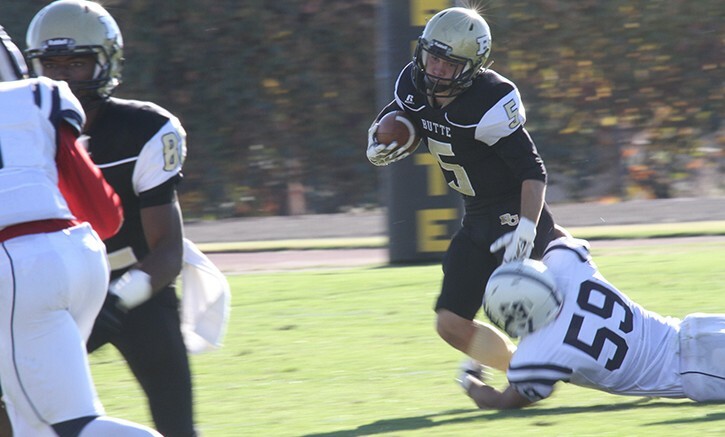 Butte scored on a 22-yard pass from Tommy Hayes to running back Martin Flemming which put Butte up 7-6. Keil made a 25-yard field goal to put ARC up 9-7 and ARC extended the lead to 17-7 Vercher hit Malik Dumetz outmuscled a Butte defender for the ball and sprinted for a 36-yard touchdown while Vercher ran in for the two-point conversion. Vercher was 18 of 31 passing for 307 yards with two touchdowns and one interception. He lead a 92-yard, 7-play drive in the fourth quarter that culminated into a 38-yard touchdown pass to wide receiver Marc Ellis that put ARC up 24-21 with 4:43 to play. Ellis finished with 3 catches for 72 yards. Osterhout praised Butte’s effort and consistency. “It was a championship environment,” said Osterhout. ARC hosts Sacramento City College this Saturday at 6 p.m. in the team’s final game of the regular season. Be the first to comment on "Last-second hail mary dims ARC’s playoff hopes"